Any knitting pattern can be changed, modified, and enhanced upon. As there are no "knitting police" per se, Magic Pixie Knitter designed a knock-off version of the Bliss baby sweater and posted it as a free pattern. Yours truly had some lovely MadelineTosh worsted hand dyed yarn in the "Rose" colorway and knit this baby jacket pictured here, changing the ribbed detail once again. The baby jacket is knit in one piece, beginning with the back, adding on the sleeve stitches, then picking up stitches for the front panels. Instead of using Magic Pixie's reverse cable rib pattern five times total, three repeats were knit along with three rows of moss stitch to the front panel and two repeats and three rows moss stitch to the sleeves, which were knit flat instead of on dpns in the round. Since there was no direction for a buttonhole, two toggles were knit by casting on 27 stitches and then binding off. This is a very quick knit baby sweater pattern. 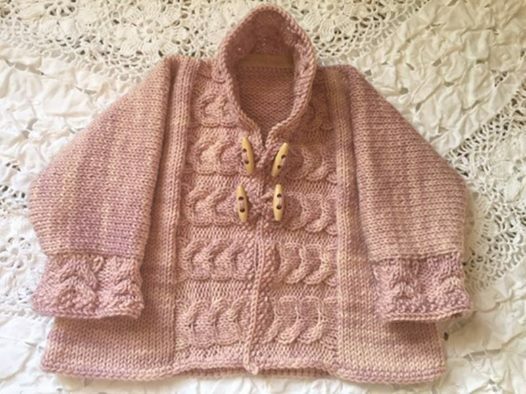 Debbie Bliss Ribbed Baby Jacket (link may be take a few more minutes to download as it is from Wayback Archives) Magic Pixie Knitter's free pattern version More baby sweater patterns.